Crystal Crusies offers one of the world's best larges luxury-ship experiences. Crystal Cruises has won the "World's Best Large Ship Line" awards from the readers of Travel & Leisure and Conde Nast Travelers for an unprecedented ninth years in a row. Six-Star-rated Cruise Line. Celebrate the holidays with Crystal Cruises this winter in some of the most breathtaking and tropical destinations in the world including the Caribbean, Mexican Riviera, Canary Islands and Hawaii. Experience the festive décor aboard Crystal Symphony and Crystal Serenity. Celebrate Thanksgiving complete with the traditional meal and trimmings and enjoy a wide array of family-friendly activities. Ashore, visit the white-sand beaches in Cabo San Lucas and Puerto Vallarta or the moorish castles in Lisbon. In December, unwind aboard our holiday sailing and ring in the New Year while exploring the crystal-blue water in St. Thomas, Grand Turk or sail to Maui and Honolulu in the Hawaiian Islands. Free Air - Enjoy free air on our round-trip Lisbon cruise. Kids Sail Free - Sail with your family (children 17 years and younger sail free) on 14-day voyage 0331! On board, Crystal offers a myriad of family-friendly enrichment and entertainment. "All-Inclusive. As You Wish." - Receive "All-Inclusive. As You Wish." spending credits of up to $2,000 per couple (voyage 0328 $2,000 per couple; voyages 0227, 0231, 0331 $1,000 per couple). This is your perfect opportunity to celebrate the magical holiday season among family and friends with our Crystal Family Memories Program. For every 6 guests, Crystal will provide pre-paid gratuities, a $500 credit toward a Crystal Private Adventure, free berths for kids 17 and under, and more. Or, sail with 10 guests and receive all the above perks, plus one additional free berth. It's not too late to book the Holiday vacation of your dreams. Come celebrate the spirit of the season with the World's Best. Call us at (800) 990-3454 today! * Fares listed are for for category E on Crystal Symphony and category C on Crystal Serenity, in U.S. dollars, based on double occupancy and do not include port, security and handling charges. 2-for-1 Fares are per person based on 50% of brochure fares. Brochure Fares, in effect as of 9/21/09, may not have resulted in actual sales. Kids Sail Free offer applies to voyage 0331 only. Applicable only to children 17 years old and under when sharing a stateroom with two full-fare adults. A third berth waiver is required. Kids sail free offer is not combinable with any other programs. Free air is available on voyage 0328 only, from select gateways, routes and carriers, and is available from the following gateways only: BOS, JFK, EWR, BWI, IAD, PHL, YUL, YYZ, ATL, MCO, MIA, TPA, DTW, MSP, ORD, DEN, DFW, IAH, SEA, YVR, LAX, PHX, SFO. Air add-ons for other gateways are available from Crystal Cruises' designated gateway cities in the U.S. and Canada. 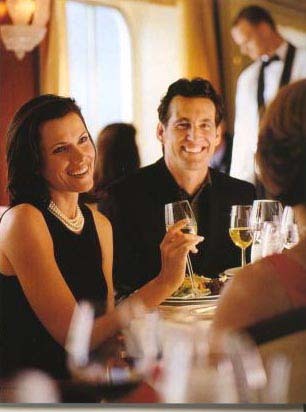 Air routing, scheduling, and carrier selection are at the discretion of Crystal Cruises."All-Inclusive. As You Wish." $500 per person ($1,000 per couple) shipboard spending credit applies to voyages 0227, 0231, 0331; $1,000 per person ($2,000 per couple) applies to voyage 0328. Shipboard credit is not redeemable for cash and cannot be used in the casino, for bingo or towards future booking deposits. Single Traveler Fares are based on the cruise-only fares. Crystal Society savings are per person based on double occupancy. Fuel surcharges may be added at any time to defray increased cost of fuel, even if the fare has been paid in full. All offers may not be combinable with other promotions, apply to first two guests in stateroom or suite, are capacity-controlled, subject to availability and may be withdrawn or changed at any time without notice.